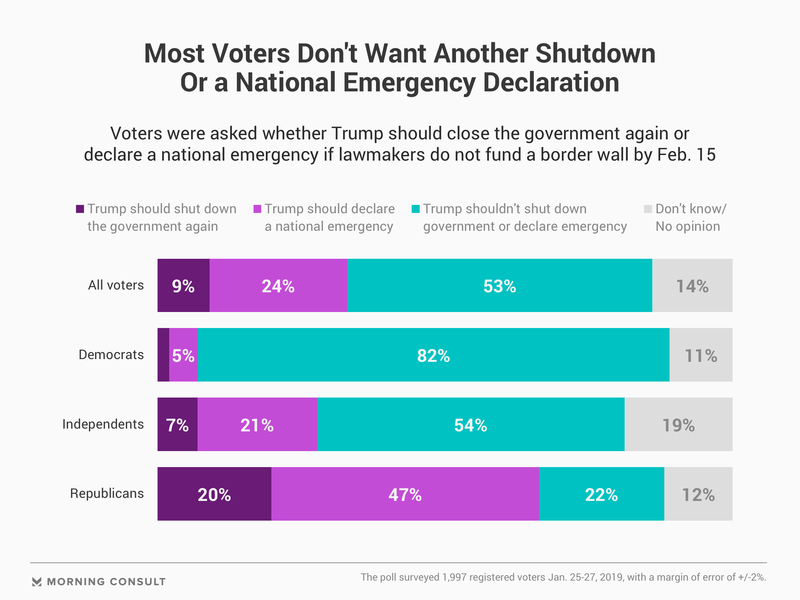 53% of voters said Trump should not shut down the government or declare national emergency if lawmakers don’t fund his wall by Feb. 15 deadline. 64% of GOP voters said they thought it was unlikely that Congress would provide full funding, up 10 points since December. President Donald Trump may have agreed last week to sign a bill to reopen the government for three weeks — ending the longest government shutdown in U.S. history — but he warned Congress that he still wants money for his proposed U.S.-Mexico border wall, one way or another. “So let me be very clear: We really have no choice but to build a powerful wall or steel barrier,” he said during a Jan. 25 speech from the Rose Garden. If Congress doesn’t allocate funding, he threatened to either shut down the government again when funding lapses after Feb. 15 or to declare a national emergency at the border in order to circumvent lawmakers’ power of the purse and begin construction of the wall. A new Morning Consult/Politico survey conducted Jan. 25-27 finds most voters would prefer he did neither: Fifty-three percent of respondents in the poll of 1,997 registered voters said Trump should not shut down the government or declare a national emergency if lawmakers don’t fund his wall, while about a quarter of voters (24 percent) said he should declare an emergency. Only 9 percent said Trump should shut down the government. Speaking to reporters Tuesday on Capitol Hill, Senate Majority Leader Mitch McConnell (R-Ky.) said he wants Congress to find an agreement before the Feb. 15 deadline that would avoid another government shutdown or a declaration of emergency powers by Trump. “Exactly how to do that has been quite challenging,” he said. And while nationwide public sentiment is largely behind Congress’ most powerful Republican, his party’s base is not in lockstep. Given the three options – another shutdown, an emergency declaration or neither – a 47 percent plurality of Republicans said they would support an emergency declaration by Trump if Congress does not provide wall funding. And given just the option of another shutdown or no wall funding, 64 percent said they’d back the former over the latter. 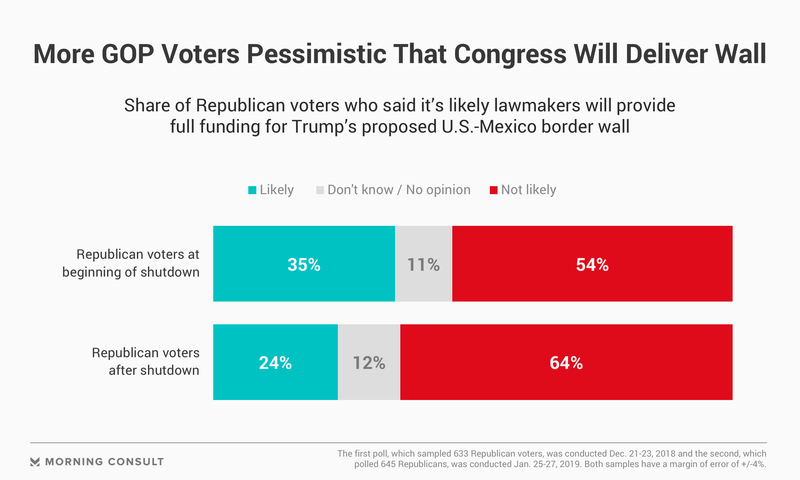 Even as Republican voters remain persistent in their desire for building a southern border wall — it was their top priority for Congress in the online survey — in recent weeks, they have lost confidence that the president will be able to secure funding. Sixty-four percent of GOP voters in the latest poll said they thought it was unlikely that Congress would provide full funding for the wall, up 10 points since a Dec. 21-23 survey of 1,992 voters conducted as the shutdown began. Trump’s decision to end the 35-day standoff and sign legislation reopening the government without wall funding left the bulk of Republican voters feeling either frustrated (34 percent), angry (5 percent) or sad (5 percent). Despite negative feelings among Republicans regarding the outcome of the shutdown, the base is still sticking with the president. At 81 percent, Trump’s job approval among Republicans remained unchanged in comparison with a pre-shutdown survey, with 51 percent still strongly approving. While the president’s core supporters stand by him, the shutdown brought significant consequences from the broader electorate. According to Morning Consult tracking, Trump’s average monthly net approval rating was 13 points underwater in January, tied for the worst of his presidency, driven by sharper negative views among independents and Democrats. Most voters (52 percent) said they blamed Trump for the shutdown, compared to 34 percent who blamed congressional Democrats. And roughly the same shares – 50 percent to 33 percent, respectively – said they would distribute their blame similarly if the government shuts down again on Feb. 16, when current funding expires. And while polling shows Republicans lost the messaging battle of the shutdown, they still have a slim advantage when it comes to the policy argument: Forty-two percent of voters said they trusted Trump and Republicans in Congress most to handle border security, compared with 36 percent who sided with Democrats.